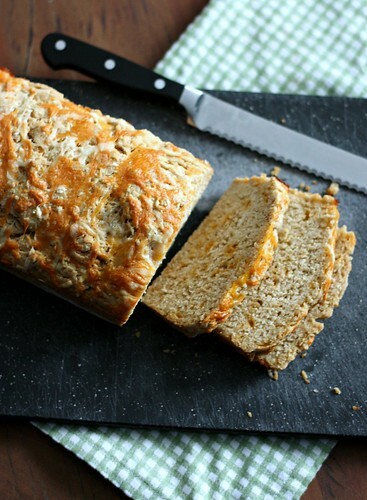 Cheesy Beer Bread – Elly Says Opa! Over the years, I’ve become a lot more confident in making yeast breads/doughs. I don’t make them that frequently but I’ve had enough success that I’m not as…scared? Worried? Crossing my fingers and praying in the corner? So, I thought for sure I could dust off the old bread maker I hadn’t used in ages and it would be even easier than the old fashioned way I’d become comfortable with. On a day the kids and I were home alone together, I decided it would be a fun and easy activity for them to help with. We dumped everything into the bread machine and waited. What we got was a barely risen, dense loaf. A cheesy, garlicky brick. I’m still not entirely sure what happened. Everything seemed okay going in. But it really killed my confidence because it’s a bread machine! It does the work for you and is supposed to be foolproof! The next week I wanted to make a new yeasted loaf recipe but the store was out of an ingredient I needed. Taking both things as a sign, I decided to take the easy way out and just make some beer bread. I stayed pretty basic with this one, just mixing in some garlic powder and cheese. You could of course add herbs, peppers, swap out the cheeses, whatever you want. The loaf will be done in less than an hour and you will end up with a tender bread with a nice crust. No machine, finger crossing, or…ahem…swearing necessary. Preheat the oven to 350 and spray a loaf pan with cooking oil. Stir together the flours, sugar, baking powder, garlic powder, salt, pepper, and all but 2 tablespoons of the cheese. Lightly mix in the beer using a wooden spoon until incorporated. Transfer the dough to the prepared loaf pan. 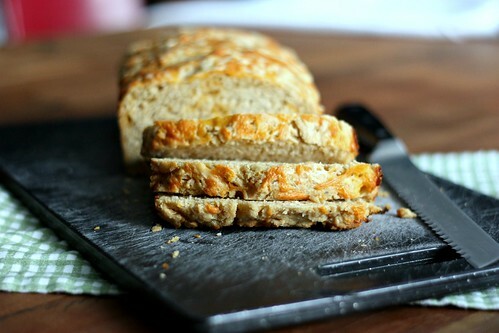 Pour/brush the butter over the top of the loaf and sprinkle with the remaining 2 tablespoons of cheese. Bake for about 40-50 minutes.